I prefer a Java app above a web app, because starting a new "modern" web development requires you to pull a bunch of dependencies and a lot of files before you can start. While Java just needs the JDK and one Java file, even on a Raspberry PI (as described in PiJava - Part 2). But building a JavaFX as a single file which you can run on multiple platforms, requires some more steps. In this tutorial we will build a .jar which can run on any device which has the Java runtime and JavaFX modules installed. I have most experience with Maven to do this (Gradle is alternative), so I worked out a minimal example to do this for a JavaFX 11 application. I've used IntelliJ IDEA to make this example, but you can also use Eclipse, Visual Studio Code (full documentation for Java in VSC here) or another IDE of your choice, but maybe you will need to install Maven (which is the build tool) next to it in that case. A Maven project is defined by its pom.xml file. This XML file describes the project and how it should be packaged. There are a lot of optional settings you can define, but in this project a strict minimal file has been created, check it on GitHub for the full content. I've added a lot of comments to make sure it's clear why each part was added. My goal was to be able to build the application on a PC (for fast development and testing) and run the compiled .jar on a Raspberry PI. One important part in the pom is the dependency to the JavaFX controls library which is needed to build the demo app with some Labels and Buttons. compile the code with "compile:compile"
start the application with "exec:java"
the jar can then be found in the "out" directory. We start with an example JavaFX VBox with some Labels and a Button, so just some basic demo functionality. // We need a private variable so we can change the text on a click on the button. The Main class is called as the starting point of a Java application. We make it an extend of javafx.application so it will start the scene when we run the application from our IDE. An addititional Launcher class is needed if we start the JavaFX application from the .jar file. The Java SKD or runtime, but as we are developing in Java I assume you have this installed. 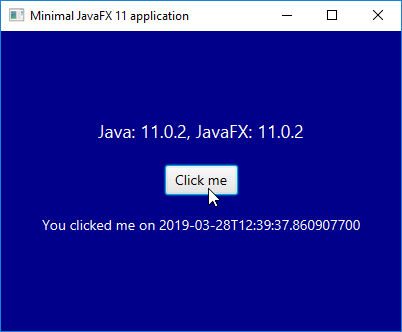 JavaFX 11 which you can download from GluonHQ. I unzipped it next to my Java SDK in "C:\Program Files\Java"
To start the .jar we need to provide the additional module path to the JavaFX location. OK this has become a pretty large blog, but take a look at the sources itself and you'll see the code and pom file are pretty small and self explaining and/or documented.